Spanish Singer, said in an online chat: "My size. I'm 6'2". I think a lot of people think I'm smaller though". On the Jonathan Ross he also said "That's what a lot of people say! They always think I'm a lot smaller!...I'm six two.... I wasn't tall in high school. I was pretty small, I suddenly grew." @TIM: Yah and I geuss he had his 5cm(excluded insole) Vibram sole boots on? He is at best 185cm without his MASSIVE Vibram Boots. I am 186cms and met him at one of his concerts. He had a touch on me 187cm I would give him. I was sceptical he was tall until I met him. "Hey Felipe, Bosé has been described accurately to be 186cm, which is an smidgeon taller than 6'1"." Hey, Alan! Only 3 years late, but I'm here, LOL! 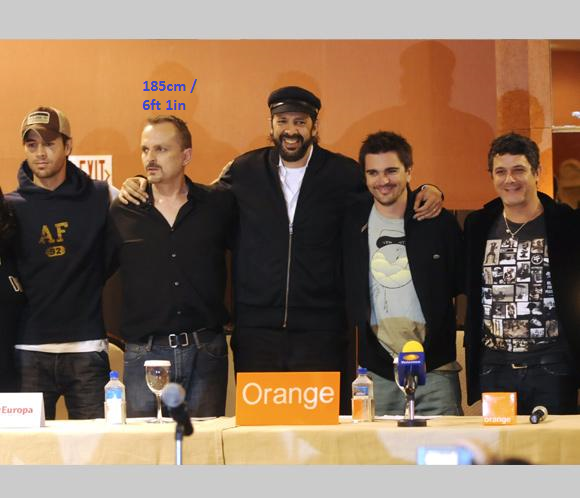 Next to Ricky Martin, Miguel Bosé seems to be 185cm. I think he has lost some height or Ricky Martin (listed as 181.6cm) needs an upgrade. You can't blame him if he's a lift wearer though a lot of male celebrities are lift wearers I've been to a concert of him and he was wearing tennis shoes like he is easily 6'0.75 to 6'1. @Hijopotamus: Absolutely agree, studying lots of material on Enrique at stage and off stage clearly shows Enrique without his massive heels isnt taller then 183cm not more. Hippo, under 184.5 is impossible for Enrique, and I'm not convinced this guys a lift wearer, he'd have no reason to being so tall. Unlike brad pitt who is in limbo being at the border of Average and tall. Doesn't Enrique look like his Dad? Yes, he has the same dark brooding looks AND boasts an inch or so extra height! Many would consider him a lucky boy! I will give him 6ft1.25 but he won't be getting a nice cup of tea from me just because he has the statutory male good looks! I'm not that easily bought! But he can have a mediochre bottle of milk to help maintain himself this evening,🍼and a couple of rock cakes 🍪🍪! Lift thick shoes wearer like Brad Pitt. His father Julio was exactly 6 feet when was young. Enrique is a bit taller than his father was. @MarcusTheSwede: I can't believe you're still here arguing for a downgrade. It's been 5 years or so since I've been seeing you here. 2014 was the last time I left this page and you're still here. You need to get a life dude. I don't know why many people think spanish people are short. It is false! Today a lot of spanish guys are taller. Our president Mariano Rajoy is 187cm our king Felipe is 197cm near 2 m.
Remember,Spanish people living in Europe not in Mexico or Ecuador. And to me Enrique is a solid 186cm not less, his father julio maybe 183cm when he was young, now Julio around 180cm because he has problems with his back and is a old man. Rob, are you talking into account that he might wear lifts? He looks 184cm to m me... Thoughts? He is 188cm, no question about it, i saw Enrique next to Djocovic who's a legit 188cm and both exactly the same height, Enrique is a really tall guy. Rob, any guesses for Julio Iglesias? I think 6ft1 peak and maybe still 6ft today or close. He's 72 now. Editor Rob: I'm struggling to see him 6ft 1, 6ft peak I'd go with. Often in high heels, lifts. 187 cm?! He doesnt look taller Then Ronaldo and Ronaldo slouching. Enrique Wears huge heels. Just Google Enrique heels. He Wears Vibram thick thick sole. He is tall but not more Then 185-186 without massive heels. Rob, could you add Julio Iglesias? I can buy 6ft1 peak and today about 6ft. No recent pictures of father and son to make a comparison though. But I reckon Enrique would have close to 2in on him. Hijopotamus: Well someone must educate you girlfriend ;) No just kidding hope all is well Kind regards to you. Rob or Anybody, can tell me how this guy looks next to Enrique?. Marcus, you talk too much, girl. And by the way: Enrique is one awsome Singer and artist and person but that has nothing to do with discussing his f height. Look at him with 185 Ronaldo. Both in trainers. Just Google the picture. Enrique is tall no discussion about that but ge always always wear thick thick Vibram soles on his concerts or and high sneakers he needs a downgrade he has a very perfect lean body that makes him look taller but about same height as Ronaldo nothing more. Thanks. hipo: well I really dont want to be rude to you back as an x paratrooper I can assure youre troubled mind I havent BUT here we discuss height and I can assure you this Its much more intresting when famous people claim a height they dont really have. And thats what I personally find very intresting. If you dont like it I suggest you read people that upgrade I and many others here search for the truth. And If you find that hard to understand well Then you are really on the wrong forum. We discuss here and hey I can be wrong sometimes but its rare. And just so you understand I dont f dislike actors or models no matter and either way the round up their height or not we are all out for the truth and focusing on that is good enough here. Understod. Good boy. Thanks and end of pointless answer to no name idiot subject person. 187 all right, very tall. Marcustheswede, dude you do have a height complex. You keep downgrading everyone and that is very suspicious and fishy. he's tall like listed here, but why he still wear thick boost???? I just found out that Julio Iglesias, Enrique's father, is listed as 6 ft 1 in goo'gle. I've looked at photos of him and he really does look tall. Quite tall for a man of his age, born in Spain. But of course, he's from upper class family. That makes quite a difference. And no wonder Enrique is that tall too. Tall family it seems. ValeryL: So you Say.....any pictures what model of sport shoes some has about 3cm heel and even the one that looks flat still often have a total 2cm atleast not the sole included I still think he is much shorter just look With Ronaldo Who I think is listed 185cm next to Enrique well there are no diffrence and they had same sort of trainers on and Enrique standing With better posture he is 185 at best without huge Vibram or thick soles majority of pictures proofs it so IF no one can find a full body picture with shoes included this listing still to High needs downgrade to 185. I am proper 188-189 and took photo with him couple days ago before his show he was in flat sport shoes and we were similar of maybe 1 cm different. So I think 187 is righ.t I am a girl and I hate my huge height so have no reason for lying. appe4: Thanks! Finally someone has got it right. And seen those boots shoes with massive heel that he always wears Vibram with massive massive outersole and inner build up not in count only the outer sole is massive. Finally someone sees it. Enrique needs a downgrade. I love him to death but this listing needs to be downgraded. I met him in Mexico twice in my hometown, 6'1", he was taller than Mickey Rourke and Johnny Depp and much taller than Antonio Banderas. LISTEN. Pictures where not whole body shows are WORTHLESS. Full body pictures with shoes are the only one that tells the truth. Enrique is always always wear thick vibram soles that give him atleast 5cm and that incount not the build up inside. Hey Felipe, Bosé has been described accurately to be 186cm, which is an smidgeon taller than 6'1". I think Rob nailed it. In this picture Click Here he is next to the Spanish superstar Miguel Bosé (who is 185cm tall) and he (Enrique) seems to be just a little bit taller. Strange how some websites still list him at 6'3. Enrique is 184cm. I thought he was taller BUT..lately Ive seen him and he always always wears Vibram soles and they are thick as nothing out of this world. They would give him 2-3cm minimum and next to Cristiano shows clearly he is not 187 he wears sneakers and same height and thats generous. He is 184 not more. He always wears massive Vibram soles and appear 187 but he is at best 184 without them. Im a great fan of him but know I see why he always wears them. The pic with Cristiano also nailed it. This listing needs a downgrade. From that picture with Cristiano who is 185.5 cm tall, has 2 cm thinner soles than Enrique's, if he wears the same heels, I think they would be same,but with a good posture Enrique can pull off 186 cm, so I think 186 cm will be a good shout for him. flat 6 foot, yet he had a big thick insoles yet he was smaller than me, I'm 188 cm. E. Btw Cristiano is 185 max. Enrique is 184 max but always uses thick sole footwear plus his wig and slender figure people can think he's taller than he really is. 187, 2 cm taller than legit 6'1 Ronaldo. I mean, Ronaldo really is the epitome of 6'1. Nice find, MarcusTheSwedge, though, I'd definitely give him this listing. He's taller than 185cm Ronaldo, but it's a very slight difference. And that is with shoes. And with a height advantage to Ronaldo cause Enrique got thicker soles on his shoes. Enrique is AT BEST 187cm at best. No no not six two. Enrique is maximum 186cm he Always wears Heavy duty boots. Atleast 5cm heel and that is not measured with inner sole. He is not 187cm have seen him in Stockholm Sweden and I am 183cm with converse and he was at best 3.5cm maximum taller and that was with boots standing outside same Hotel same door. He was tall but without those boots not taller then max 186.Max. This listing is generous. But I can go with it.But generous 187.Thanks for great site. He is very close to 6'2. He looks about an inch taller than Ronaldo who is a strong 6'1. He wear heels with Vibram sole. That sole is a Heavy duty sole several centimeters high. I have looked to almost every Picture of Enrique thats out there. And also seen him in those shoes with Vibram outer sole. And he is at most 186cm without shoes. He's not 186, he must be 187 but not 188. He seems to round up a bit when he claims 6'2. Just under 6'2 is what I would have guessed. I Think this listing is correct. He is a tall guy. Gilipollas: You probably never have seen him or Heard him sing live. For the first. He is 186-187 cm not a centimeter under that. I have seen him live both in Sweden and in US and he is atleast 186 atleast. I have seen him also at beach without any shoes on, I am 183cm and he had atleast 3 cm on me. He is a tall guy so all the talk about 183 cm you can forget. Dont speak if you dont have any real facts to back it up or have seen him in person. Also he sings awsome. I have Heard him live and well..you dont know **** about anything. He sings awsome not only at youtube or recorded songs also live he is one of a kind the best voice ever. So dont even begin with sings horrible he has the sharpest voice and the best male voice in this World. If you dont understand that well..I really feel sorry for you Gilipollas. Maybe you dont hear yeh thats probably that. Thanks for great site and please...if you just talk **** and dont back things up with facts..dont..just dont. If you have facts write. Can someone explain this, please? What do you think Rob? Enrique at 187 en Jason Segel at 193, yet no visual significant difference.. I noticed the same while watching HIMYIM. But Jason is obviously not the full 6'4, more like 191-192. So let's say Enrique is honest and really is the full 6'2, or at least close enough. A hunched Jason Segel would be around 6'2 - 6'2.5, and the camera angles does the rest. I wish I had like his height however I'm 6'0"
A strong 6'1'' man 186-187 cm. Can look 6'2'' but he wears heeled boots a lot. His Dad is like the dictionary definition of debonair. Not surprising Enrique inherited his father's way with women. Julio looked a legit 6'1" guy in his prime I thought. Wow, he's listed at 6'3! Mmm, from the Will Smith school of height estimation obviously.. Honestly speaking , i thought you were 5'10 or 5'9 . This really is a shocker. Why? 6'1.5" isn't very tall and Enrique has always had chicken legs and been quite gangly in frame which makes him look tall. Honestly I was far more surprised at Timberlake claiming almost 6'2"!!. I had always thought he was quite short. Anyone got the Ross video? Ross is a legit 6'1, would be good to see them side by side. Sylinher: Yes I agree he towered Pitbull in that picuture but in videos if you look for example youtube..well Enrique is taller then Pitbull..offcourse expected as Pitbull is listed 171...then even a 179cm guy would look visiable much taller..but if Enrique is 187 he really really should tower him in more pictures and also in videos that show them together. And he doesnt. He is visible taller but not as much as 187 cm...I think he is about 185.186 at most. Enrique is great..and he is tall.....so DOODSS...you are so way out wrong..Enrique is tall. No doubt about that.. But 187 sounds little to much even for me..im a big Enrique fan..and I have seen in also in irl , I am 185cm and without those shoes he has on..I dont think he is much or even taller then me..looking at him at street he looked like a tall guy..but not..much taller then 185. 186.He is tall but maybe time to downgrade little. He was as tall or taller than Jason Segel, who is listed here at 6´4, in How I met your mother. And please don´t try to tell me it´s all footwear and camera angles, because it was a straight shot, and Enrique was wearing sandals. Does that make him 6´5? Someone needs a big downgrade, and I´m not talking about Enrique Iglesias. julio iglesias maybe when he was young 6' 1' now he looks shorter than rafael nadal 6' 1.5'. I also think Jonathan Ross is a solid 6ft 1in guy . & a peak 6ft 0in is my estimate for Julio Iglesias. By the way , his father Julio Iglesias was 1'81-1'82 when young. Yeh he only seemed about a cm taller than 185 Cristiano ronaldo so 186-187 is about right. Once again Rob has nailed it. Real short, because he is under 6'2"... LOL. @ nice guy He can look 6'3" actually in those boots he wears and probably is. I think I remember him looking about this next to the G maestro, or he was slouching or something, can't remember.. In a concert I stood next to him for a few seconds while he gave me his autograph and he looked only an inch taller than me, like 2-3 cms. I'm 6'0.5 just out of bed (184,15 cms) but this was at 9 pm so probably I dropped almost 1 cm by that hour. If I was 183,15 cms in that moment he was no more than 186 cms. So he is taller than 6'1, probably 6'1.5 in the day and 6'1.25 at night but he was clearly not a full 6'2 guy. Both were in casual shoes, no apparent difference in footwear. Agree with the listing. @silent d - No, he doesn`t look the full 6`2. He always looked tall to me. Just give him 6 foot 2. I've been very close to him and he is really very tall. I thought he was 1,87 m not more, bat not less. I'm 1,8288 m exactly , just the same as 6 ft, and he was unless 2 inches taller than me. @Myself - where`s the pic? - the link just leads to his fb,did he change his pic?,could you see shoes/ground in the pic? I don`t know this Mohombi dude but he might be well over listed. @Naisha - I highly doubt he reads this. @Pinky He doesn`t look the full 6`2 to me, 186 or 187 for me. I didn't think Enrique was so tall. if you clic in the photos you can make them larger, and in the one with 5 people, you can see the shoes a little. Adriana according to her modeling agency (which are not always believable) is 5'10", and I belive that 5'10" and don't think she is less than 5'9". Erin Heatherton is in the same agency as Adriana, and they say Erin is 5'11". VS usually gives Adriana higher heels than Erin, but Erin is taller than Adriana. I thought Erin reached 6', and thought Enrique would also be about 6'. But after seeing those photos, not anymore. Adriana's heels must be high and also with platform, Erin's booties are not flat. And Enrique's shoes increase his height, but still, Enrique and Erin can not be 6' as I thought. Cool hight.I've never meet with Enrique.But I want to meet with him. Again, look at the shoes. Check the interview from 2010 with George Lopez...massive heels on those shoes. Rob, any guess on Julio Iglesias's height? @Eddie - he does not look the full 6`2. Nope just under 6`2,probably just over 6`1. Enrique easily looked 6'1"-6'2" on Two and a Half Men next to Charlie Sheen. wow I always thought he was average height! Funny how he's tall but doesn't appear to be when by himself with no point of reference. Maybe it has to do with his arms a bit on the short side (proportionally speaking that is). You can believe it when he stands next to Pitbull. I have a question about his weight. Who knows how much does he weight? Just after the 8 minute mark he claims he's '190 exactly'. Could that be legit? Well, I'm 187cm barefot and measure 190 in regular shoes. Maybe he got measured in footwear at 190, highly likely. Cos he aint 193 ( 6'4" ) in shoes, that's for sure. 'I suddenly grew." how?please tell me enrique bro? @man have you met him? no,he just looks in his music clips shorter than 6'2. i just can't believe that he is 6'2,he looks way shorter. rob about how long do you think a 6 ft 1 male's head is? how long does enriques head look? Rob do you think enrique is taller or will smith? i belive he is 6'2 becuase if you go to his website, there are fans who have met him and they ALWAYS talk about how tall he really is in person. they even have pictures of him standing next to the fans who claim he is very tall and they compare the height difference and once there was a picture of a 5'4 girl next to him and he was basically towering her. i believe it was almost a whole foot difference so 6'2 should be right becuase the fans always put him as a 6'4 guy but i think they were just over exagerating. Rob he seems like an honest guy. Maybe he is the full 6"2? please rob, half an inch upgrade? 188cm on the nose for this guy. Most sites have him at 6"3(191cm)...which is too tall. Julio Iglesias looks exactly the way a legit 6'1" does. Enrique looks close to 6'2". I think Dany is right.Enrique is 6.1 without the 2 inc shoes he always wear.Have looked at hundreds of pictures and seing the video when he sings beside Ciara said it all.She had high heals and comparing with his footwear he is max 6.2 without shoes.Great singer.Awsome but 6.2 max. Segel is 6'2.75 or 6'3 at best, not 6'4. He has to be a real 6'2". I'm going to echo those comments about seeing him next to Jason Segal (6'4") in How I Met Your Mother. They looked practically the same height. Similar footwear too. Jason was slouching a bit but there could not be more than a 2 inch difference. pics of enrique and ciara. looks like there's about 3(maybe some change) inches between them. I went to see him in concert at the O2 arena in london and i was sitting at the front. He wears boots that have nearly 2 inch heels. This is a fact. He is 6ft 2 - IN BOOTS. Barefoot he is probaly around 6ft 1. I agree that Enrique doesn't look that tall, even with his build, but I was surprised when I recently saw an episode of How i met your mother (episode 1, season 3), where he seems to be practically the same height as jason segel. Either Jason's height (listed as 6'4) is overestimated or enrique really is a very strong 6'1. im 5ft 8 and feel tall for a girl, a guy whos 6ft 2 with his looks and body is amazing!!... in his video with ciara shes the same hight as me and looks tiny its great! Enrique is so beautiful, and a tall man with such a perfect body as Enrique's it's a dream... At least for me. Looks about 185 cm next to Glenn. I've always thought he is a legit 6'1"er and wears boots. That with his slim build makes him look taller. I've always seen him listed in magazines at 6'1" (and they normally claim things like Vin Diesel is 6'4" and that too!). His father Julio was 6'1" too. I'd buy 187 max for I don't think he is the full 6'2" barefoot. In boots he must be 6'3"ish though which he always seems to wear. Rob why don't you give this photo the same treatment you gave the Lazenby pic. Can't you work out his height from the statometer is comparison with Glenn's height? That was a pretty interesting stuff you said there. When I said that thingy about economics being good can encourage the growth of a few generations, I did not mean that because they have more money they become taller Bud! I was simply saying that if several generations of people have more access to a variety of foods and are well nourished it could effect the potential of growth for those generations. Pretty interestin' stuff you got there Big Fella! Where did you get the average height of 18 year old males in Spain is "more than 5'10"? Last time I checked it was just about 5'8.9 (175cm) with the entire male population being 5'7 and the average young man (no more than 30 years old) being 5'8 and it was recently. Someone being 2-3 cm's taller than you does not mean they "tower" over you. To tower over someone you would have to be a at least 5 inches taller than them. people from sweden are tall, I noticed that when I was there 1 year ago. really tall. I was slightly more surprised when I travelled further to Norway and noticed that they seemed even taller..
Dani: Ok I also think 187 is ridicilous..I am a big fan of him.But I believe you when u say he was about 1inch taller then you..and that would make him about 183.5. I think it is time to downgrade him in height. He always wears reeealy high heeled shoes in many pictures..not 187cm tall.time to downgrade..
Jonathan, you know nothing about Spain. See figures for average height of 18 year old males and is more than 5'10"
alright people. one thing for everybody that thinks they know their history. im a descendent of cherokee and when the queen from spain sent cortez over to the northern part of mexico into the texas region, the records from both sides spaniards and cherokee both of them were sizing each other up and for people that dont know cherokee ancestry look in the internet for sequia the tribe leader he died in the northern part of mexico in a town called muzquiz coahuila. so all the mexicans that are tall in that region most of them come from that blood line may range anywhere from 5'9 to 7 feet back in those days. with men ranging from dark skinned not black to white to red skinned with blue, green, hazel and brown eyes. from red hair to dark brown and freckles so everybody that keeps on saying they are european please study your background before you say that. and this is what cortez said he saw when he arrived. in his articles it sounds like he was kind of shocked his men were shorter that the average cherokee so just keep on talking and dont think that because people have money that they are taller, oh and by the way i signed in about 5 months ago and i checked all enriques sites and on all of those sites it said he is 5'10 and i come back to this site and it says 6'2 thats bull. what did i tell you about money. they did the same thing back when they came over to our part of the world. they werent caring about teaching christianity which is good they were thinking about taking over and with their guns they sure did it. the cherokee men were so strong that one of their men could take on 4 spanish men. that is why they took us out. especially the giant cherokee. that is why an average 5'9 5'10 man could sometimes have a son that reaches 6'6 to 7 feet because that blood is in us. they came over to take over and since they had the guns they sure did. and now they say this is the new spain. so for all of the cherokees and mexicans be proud. there is allot to be proud for. Thanks sodapop. I'm about your height (176cm = 5'9.5? )and I'm 15. I generally feel above average for my age, but since I've a lot of friends who play basketball(I'm speaking about few guys in the 5.11+/6'2 range)I sometimes feel shortish. But when I return back home, I realize I'm not. I don't know why in this site people say 5'9/5'10 is short, I think it's very pointless. I know in that range you're not a giant, but you aren't short, especially at 5'10, which I think it's above average in the most part of the world." Yeah Marcus i agree with you. He seems tall but not that tall(187cm. when i met him he was 1 inch taller than me. Im around 181cm so he was around 183.5cm but no more than that. His claim of 187cm is just ridiculous. Dani: Ok that was intreseting.But how tall do You think Enrique really is? I mean you said you thought he was about 2-3 cm taller then u..that would make him about 185? He always wears really heavy built shoes...the guy is tall..but I doubt he is 187..
yeah Marcus, i know that swedes are really tall. I was more impressed in Sweden and Norway than in The Netherlands. I live in Minnesota USA which is the tallest state in America. Many people here have swedish and norwegian ancestry. I see many 6"2+ guys here in Minnesota. Im 5"11(181cm) and feel really average in this state considering that the average for male in the USA is 5"9.
in the video "Takin' Back My Love" he looks the same height---even taller than ciara, and she was wearing 5 inch heels!" I was in front of him Liz after a concert. We had a private party and im 5"11(181cm) and he towered my by a bit(2-3cms) so i don't buy he's 187cm. in the video "Takin' Back My Love" he looks the same height---even taller than ciara, and she was wearing 5 inch heels! i recently saw Enrique on how i met your mother. semmed surprisingly tall. he seemed very close to jason segel's height of 6'4. i also have to add that segel was wearing sneakers and enrique was donning flat sandals so segel had more heel advantage. i have to agree with the man's own words and say he is a solid 6'2 if not a little taller. i guess its hard to judge his height since he does not get many roles on screen. 6'0(1.83) should do it for Enrique Iglesias. He doesn't look like 187cms at all. I was in one of his concerts and he looked 6"1 with boots. Most celebrities lie one or two inches about their real heights. I think that dutch people exaggerate about their heights a lot. I went to Holland and visited Amsterdam, Utrecht and Flevoland a year ago with my family. Im 5"11(181cm), my brother is 5"10(1.79cm) and my dad is 5'9(175cm). I thought we were gonna be overtowered pretty bad by the dutch but I saw many people between 5'10 and 6'1 period. I have to be honest with everybody here: i didn't see many dutch over 6'1 in those cities. I didn't feel like a dwarf.I felt average in Holland. Dutch people are the tallest average however i saw taller people in Sweden. I saw many 6'2+ in Sweden, swedish people are super tall, they blew my mind. I beleive it is true when they say that economics in turn can affect averages in height. Of course when the economy is well several generations are likely better nourished and have more potential to grow. Also There were many beliefs that encouraged capitalism like knight of the order said. It seemed where Lutheranism spread, capitalism followed. knight of the order is right.some say taller than 12 feet actually. There is fossil evidence that suggests giants existed all over the earth in antiquity. If you google it you will find tons of evidence. Scientifically this hypothesis can be proven since various old life forms on earth (i.e. redwood trees) are of colossal size compared to its contemporaries which suggest that in the distant pass the earth atmosphere was thicker which made it possible for organisms (including man) to grow much bigger than now. This hypothesis has been also verified and replicated in control experiments which scientifically speaking, show the finding to be conclusive. But as most scientists know the motivation to suppress real history found by means of archeology/fossil record and carbon dating is that science is utilize and link by oligarchs to socio-economic systems like capitalism which utilized as a platform social Darwinism. Without Darwinism, capitalism will not exist or it will be very difficult to sell to all of us. Specifically, with growing atheism and its cynic effect, and the notion that we are just biological life forms formed by evolution and natural selection, the justification that man is simply an asset under amoral capitalism appears to be justified. Therefore, any archeological evidence or theory to challenge Darwinism is either suppress, vanished, or ridiculed. As far as myths, in general there is always a grain in truth in them. Old newspaper articles and scientific journals published during the gold rush and the colonization of North America recorded various events where Indians showed to various settlers human remains of colossal size which suggested beings of 12 feet height but as it is common in this type of findings, the evidence simply just vanished. On the same note, it also possible that in the ancient past giants also walked the lands of Central and South America. If you bear in mind the technology necessary to lift the enormous megaliths to build the pyramids, which is still a challenge with today's technology, one deduction is that perhaps beings of colossal size were responsible for building these extraordinary structures. As a last note, in the Book of Enoch, the giants of antiquity are not only mentioned but numbered as a population as well which suggests a fact not a myth. Is that right some Indians as tall as 12ft. Thats amazing. Since you may not be farmiliar with the Giant native American myths I thought I would just add another Spanish claim. I also heard a myth that during the Cortez conquest of the Mexico, Cortez came across the Tlaxcala natives. They showed Cortez a leg bone which the Spanish claimed was taller than most of their soldiers! Im guessing the average height of Spaniards in the 16th century was about 5'8ish. Very interesting stuff there Knight of the Order! I am not familiar with myths on giants during the Conquest of the Americas. My citation on the giant indians of Patagonia is based on the entries made by a scribe/historian of Venitian royal birth who was aboard one of the Galleons with explorer Ferdinand Magellan during the first expedition that navigated around the globe. The scribe wrote about the indians in detail and to me this is not myth but factual. Various English explorers also reported sightings of giants indians in Patagonia (some as tall as 12 feet!) but I will not placed their reports as reliable since after England became the premier world power or after most of the Spanish Armada sank during a nasty storm in the English channel, the English denied the existence of the giants indians and the coverup to preserve Darwinism by the English began...but that is another subject. Another interesting fact to cite in regards to the height of Spaniards of the 16th century and the soldiers of Spain in the Americas or conquistadores as they are commonly known is that they were not short compared to all the Europeans of the time. If we take into account the average height of the descendants of the conquistadores which are now part of the oligarchies of Spanish America, one can note with that the majority of them are of above average height compared to the rest of the local population. But a more reliable way to observe and verify this height difference is through face value or when one visits any country or various countries in Latin America. Another fact to note in terms of average height of a conquistador is that Spain was the only European nation to have and employ full-time professional soldiers in the 16th century. It enlisted in its ranks citizen-soldiers from all territories under Spanish rule including Austria and the Netherlands. Heeeeeyyyyy Knightof the Order!!! I recall hearing something about of the ancient myth about giant Native tribes. I also heard rumors of 8ft+ tall skeletal remains found in central south america. Also Pizzaro Fransico claims to have seen these giant human beings during Incan conquests in the 1500s. yeah didn't think that feller was that tall. he appears to be at least 6'1.5". The fact is that during the conquest of the Americas, the Spanish Conquistadors under the leadership of the Queen of Spain were ordered to convert the indigenous people or Indians to Christianity and to teach them the Spanish language and culture and thus, the Indians of Central America and South America survived the conquest of the Americas. Unlike the British, who exterminated and nearly genocide the North American Indians except the few left who were isolated in reservations, the Indians of the rest of the Americas were allowed to live because of Christianity and the royal decree by the Crown of Spain (Queen Isabella who was influenced by one royal adviser named Ferdinand the Wise) who declared that all man were created equal under God (as the Bible commands and as Christian Spain believed at the time). (amended and more inclusive: webmaster please delete my last posting) The fact is that during the conquest of the Americas, the Spanish Conquistadors under the leadership of the Queen of Spain were ordered to convert the indigenous people or Indians to Christianity and to teach them the Spanish language and culture and thus, the Indians of Central America and South America survived the conquest of the Americas. The fact is that during the conquest of the Americas, the Spanish Conquistadors under the leadership of the Queen of Spain were ordered to convert the indigenous people or Indians to Christianity and to tech them the Spanish language and culture and thus, the Indians of Central America and South America survived the conquest of Spain. looking at enrique i think he looks like if he is 5'11 barefoot with shoes 6'00 feet with boots 6'1. im 5'10 with blood from italy,spain, chinese and cherokee. i look more italian at 5'10 barefooted with shoes 5'11 boots 6'00. i have 8 brothers our grandparents immigrated to mexico and mixed with cherokee and the tahrumara indians which are very tall and with some cherokee being 6'00. but i also have chinesse blood that immigrated to mexico. both chinesse and italians immigrated to mexico in the 19 cetury because of the war and later immigrated into the us in the 1960s. my chinesse ancestors standing at 5'7 and today most of my chinese relatives stand at 5'10. back to my brothers its 8 of us i stand at 5'10 most of my brothers are from 5'11 to 6'00 one of them averages at 6'6 most of us have brown eyes but except for one he has blue eyes when my dad was young he would stand at 6'00 tall and my mom is 5'2 my mom is indian and chinesse with brown eyes my dad is spanish and italian with blue eyes. im 5'10 and my brother is 6'6 i think my height comes from chinesse and italian and my 6'6 brother comes from italian and tahrumara indian which are very tall indians in northern mexico. i also think genetics play a role in your height. im an electrician that goes to allot of houses a day and most spanish people from spain that i have met are in the range of 5'8 but i have also met tall ones at 6'1 the same goes for the other races even the indians from india are know as being short but i have also seen really tall ones. we tend to go towards what surrounds us or what country we are born in but if we know our genetics background we can also be something else that we dont even look like so study your background. i once met a man that was black he looked more like blue that is how dark his skin once and he told me that he went to the dr. and they did a blood test on him and found out he had european blood. i had a friend in high school that both of his parents were black and he was very white so just because you are from one part of the world does not mean every one is short or tall. Steffen, you are correct to a certain extent when you cite various factors that may have contribute the height increase of the Spaniars and other ethnic groups. However, the term latin is misused in context, because Spaniards are descendant of greeks, celts, goths, romans, etc. Their european ancentry is notable in its people in contrast to latin americans which are in most countries in average 5% european and 20% creoles, and the rest indiginous people or american indian descent. The point is that you cannot group Spaniards with latin americans. They are two distict groups genetically speaking. alot of Aussie men are short too, I like a man at least 4inches taller than me,which wouldn't think hard, but all the good ones are taken anyway. I think its become a stereotype that latin men are short, but with the way things are inthe world we cannot say that, I see it in the middle-east, where they too were thoguht to be short, but now its so much more different. They're producing generations of Tall sleek gorgeous superbeings all colourings all types. I think it applies a lot to the mediterranean too. Maybe its the food maybe its hormones whatever it is, it is working. Both for the men and women. I think also there's a lot of interracial & cultural marriages which also contribute to that growth. Looks tall. 6ft2 is also not out of the question. Mexican people's height varies greatly by region and socioeconomic class. The middle to high classes have much higher average heights than the lower class. Northern Mexicans, as a region, are also taller than their southern counterparts. i been to a enrique iglesias concert and to me he was 6 feet at the most , i guess he looks taller depending what shoes he wears. on the thing about mexican men being short i can only coment on my own experience. my ex husband is 5,5 and he is from michoacan. my boyfriend at the time is 6,1 he was born here but both his parents are from durango. he is also diferent in that his skin is very light and he has green eyes, most of his family is tall and light skined. so maybe there is something about what part of mexico there from. mexicans is new york city,and possibly major citys in general are short.but yes,some are very tall.i know 2 that are 6-3 and 6-5.
the problem with saying mexican men are shorter is because of people thinking all mexicans are the same. the thing is men vary in height depending on what region of mexico they are from. the average height is 5'9''. but the farther south in mexico that someone is from , the shorter they are. for example in the mexican states of michocan n oxaca as well as chiapas n guerrero men only average 5'2". while in the northern mexican states of durango n chihuahua men average 5'11" , with many in the 6'3" to 6'6" range. it has to do with the north part of mexico having more european blood n the fact that their indian blood is from the tahrumara , the tallest race of indians in mexico. while in the south there is very little european blood n their indian blood is of the tarascos like in michoacan, who are the shortest indian race in mexico. How tall is mike "boogey" Malin from big brother 2? Because in the beginning of the "do you know" song by enrique he looks a tad taller. I fancy him even more now that I know how tall he is - I thought I was going to be disappointed and find out he was about 5-8 - I am so happy! Some Austrian guys came to visit our company some days ago. All of them very well educated, which means the upper hand of the population regarding height. On average they were about 1.81m-1.82m. 4 inches after 18 is not a lot try 9 inches in one year. he said he grew AFTER high school. So i checked another site and it said he was 5'10 and now his height is basically 6'2. 4 inches after the age of 18 is ALOT. Jesus. Jonathan Ross is so stupidly impressed by people being tall. Click Here - if you see this, then you would agree that he looks around 6ft - 6ft 1.
hey i'm 6ft and half. Btw the people who've met him, - are you sure he was 6ft 1 or 6ft 2. Doesn't he wear boots with a high heel ??? MD, your information is wrong. There are recent studies for the entire Spanish male population (not just for the younger generations) quoting values between 5'8'' (173 cm) and 5'9.5'' (176 cm). That means pretty much the European average. Please check your sources. Enrique house is in Madrid, the average height in Madrid 5'9.7 inches (177 cm) , from my point of view 6 ft 1.5 inches is tall, not "virtually a giant". Tur, none of those folks are average height in Spain. Just because you can pick out a few people doesn't make them average. According to all recent studies, the average height in Spain is 5'8" (173 cm) for the younger generations, and 5'7" (170 cm) for the entire adult population. In some provinces it's as high as 5'9.7" (177 cm) for 18 year olds, but that is it. Just felt I wanted to post this. Official statistics of Netherlands with the average height in all of the parts of Netherlands. I was watching an episode of how i met your mother in which he was starring (i think its the 1st episode of season3), and at one point, he crossed the doorway and seemed surprisingly tall next to Jason Segel, who had 1.5-2inches one Enrique. He really looked near 6-2. Yeah, the Dutch prove that it's not all about genetics, because they were some of the shorter people in Europe before World War II. It's all about diet and their health care system. Yeah I got a friend who's parents are 5'8 and 5'9 he is 6'8 and a half. It's crazy, it just comes to prove genetics don't determine everything. The parts I where talking about who average around 6'3 ( Groningen, Friesland) are parts with alot of farmers and alot of agriculture, so I suspect they are taller cus they eat more dairy products. The average is close to 6-3 in some parts? Thats insane. I'm sorry to dissapoint you Heightjudgde, but the current average man in Holland , is 1.85 tall, and in some parts of the country it's even closer to 1.90. I come From Holland and I can tell you this is very much true, people here are very tall. Look it up anywhere if you don't believe it. crappy.. Enrique Iglesias is 188cm(6ft2) a strong one.. Only foolish jerk think his smaller than 187 at less..
Heightjudge, the average height in Spain for men is about 173 cm (5'8). But I can tell you that there is a lot of difference between older and younger generations. The average for people under 35 is probably on the 176-178 range (between 5'9 and 5'10) but for people over 50 is far below that, perhaps below 5'7. For instance, my father is 173cm (decent height for his generation, anyway)and his sons are 187cm, 183cm and 179cm, respectively. 6ft 1in + good shoes = 6ft 2in Enrique. in "Once Upon a time in Mexico"
Enrique is 6'1. No less, no more. He definitely looks at least 6'2' ...I just saw him on the today show! Well, I don't know now. Enrique could be 6'2". I don't really see why he would have a reason to lie, as he doesn't particularly strike me as the type. Nor does he seem particularly boastful-- like say, Paul Walker who claims he's 6'3".